Of all the courses in South Africa, The Club at Steyn City is already so good. Add some years to it and it will be an absolute classic, writes BEN KARPINSKI in Compleat Golfer. There is something fascinating about golf course design and everything it entails. Sometimes a course just happens naturally, as in the ancient links layouts, and sometimes heaven and earth are moved to create something special. Having been fortunate enough to play some of the famous links layouts in Scotland, all the way through to the desert courses of Dubai, I have seen both instances first-hand, and in each case marvelled at what lay in front of me as a golfer. In South Africa we are, of course, spoiled with our wide contrast in impressive courses. But when looking to add to this incredible array, what kind of course do you create to stand out from the rest and become something to be enjoyed into the future? The answer lies north of Johannesburg, just past the ever-expanding modern metropolis of Fourways. It’s The Club at Steyn City, and it is a golf course that has to be seen to be believed. The course sits in the heart of the Steyn City Parkland Residence. Though the estate is built to be many things for many people, it is clear it may become most famous as a golfing destination. Like many other estate golf courses in South Africa, The Club at Steyn City is a Jack Nicklaus design. So you expect a hugely enjoyable golf course with wide fairways and exciting green complexes offering a great deal of variety for golfers of all abilities. Upon arrival at The Club, you quickly realise it won’t be just another golfing experience, though. For starters, the award-winning clubhouse has already been identified as one of the best in the world since its opening in 2014. It is unassuming on approach, as it is cunningly built into its natural surroundings. Yet, like everything at Steyn City, it is modern and lavish. Everything about the place simply had to be above par in all aspects, and a stroll into the pro shop and nearby locker rooms illustrates this in no small way. The practice facilities are on another level too, and this is where you will get your first taste of the unique playing surfaces that await. The entire course has been seeded with immaculate all-season rye and fescue grass, so no matter the time of year, you will be greeted by lush green conditions. It provides quite the attraction during the harsh Highveld winters, when other golf courses in the area turn brown and lifeless. All warmed up and ready to go, the 1st hole sets the tone beautifully with a par four that sees the Jukskei River running down the left side and an almost mesmerising criss-cross cut fairway up ahead. The Club at Steyn City has incredible balance from start to finish – it manages to balance the exceptional the whole way through. This has a lot to do with the natural elevation changes on the property. Add in distinctive bunkering and appealing use of water, and every hole has a quality of its own. The first four holes showcase this exceptionally, with the 4th, in particular, making you stop and stare from the tee to the green. Placed anywhere else in the world, you would have a signature hole to be proud of, but this is just the beginning. It’s not often you get a par five with a low stroke rating, but with the 6th hole you have a beast to navigate. The prevailing wind is into you on this hole, and in the winter months can get up to a genuine two-club disadvantage. Not something that is too palatable as you drive to a raised landing area. From there you are faced with the reality that the hole is a true three-shot par five, even if you are a big hitter. The lay-up is not a straightforward one, though, and in the end five is a solid score here. off the tee. The bigger hitters can try to drive the green, but with out of bounds all the way down the left and deceptive sloping short and right, any sort of daring approach to this green is a little trickier than the stroke-18 index suggests. The 8th brings the river back into play with a strong par four that requires a right-to-left tee shot to take on the green with your approach. The par three 9th hole is one of the most dramatic short holes you will have the pleasure of playing in Gauteng. 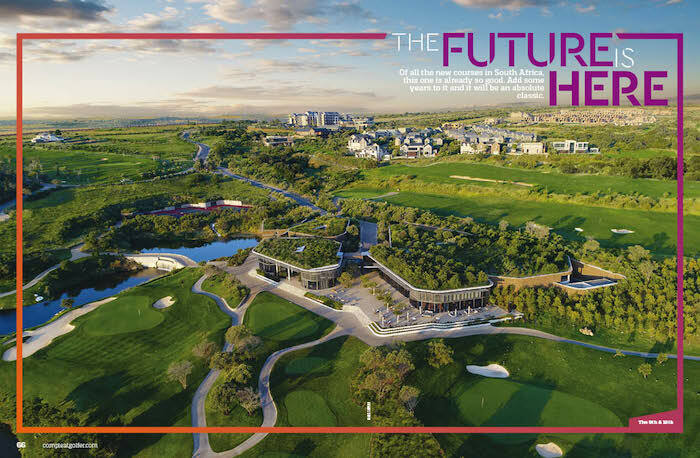 With the breathtaking clubhouse in all its glory behind the green, and South Africa’s most expensive private residence (Palazzo Steyn) on the left, you will be forgiven for thinking you are playing golf in a parallel dimension or a video game. With a mid- to short-iron in hand, and hopefully the larger-than-life distractions out of your mind, you are presented with a large landing area. But with that comes incredible sloping and a surrounding bunker complex that makes par a major difficulty. After all that excitement, the stop in perhaps the country’s grandest halfway house setting is much needed. The back nine offers much the same with regard to elevation changes, terrific variety off the tees and risk-and-reward situations that make you wish you were a better golfer to truly make the most of it. The par five 10th offers a genuine birdie chance for the longer hitters that can thread a long-iron into the green, and the 11th hole is another drivable par four if the conditions are in your favour. Aspirations of eagle can quickly turn to bogeys here, though, with water in play for any mis-hit drive, and a unique green makes you work for your score, no matter the approach. The par threes on the course are mostly fair, but all that changes when you reach the 14th hole. Again facing the prevailing wind, you can hit as much as a hybrid into this green. Once there, golfers of all levels can quickly suffer a dreaded three-putt, depending on the pin placement. The slopes will certainly require some closer observations, and here is probably where you realise just how fast and pure the greens run on this course. The 15th and 16th holes provide you with spectacular views of the entire property and you want to hit your best drive and watch it fly. The 16th, especially, as it is a unique par five which again illustrates what a larger-than-life golfing experience Steyn City is. And as you ease your way down the par four 17th, the best is perhaps kept until last. The par four 18th at Steyn City is a wonderfully constructed finishing hole that draws the round to a thrilling, albeit slightly daunting, end in a golfing sense. But what else would you expect from such a place! Norman Mashaba, golf director at Steyn City, gives us the inside information on page 72 on playing this stroke one. Once your scorecard is completed and you’ve disembarked from your golf cart, you can sit at the clubhouse and reflect on the experience. As the sun sets, The Club at Steyn City conjures up some interesting thoughts. As golfing experiences go in South Africa, it is one that comes with a rather hefty price tag, and naturally that adds a great deal of hype and expectation to teeing it up here. The purists will say it still has a long way to go until it is a truly top course, and I would agree with that up to a point. But comparing this course to other top layouts in South Africa seems a little pointless. The thing about golf is that no two courses are or ever really should be the same. The incredible facilities and all-round premium golfing experience aside, Steyn City has been designed to offer shot situations that are unforgettable. Playing here presents everything from big tee shots to delicate approaches, greens that seem to come alive with spectacular slopes and bunkers (fairway and greenside) so good that you don’t mind entering them! This course takes you through every imaginable golfing situation and makes you want to come back for more. Yes, it is still young and naturally has some overall maturing to do. But the experience is already ‘real’ and the ‘big feel’ to the place is undeniable. Over a million trees have been planted on the estate, and when they start to stand out, this estate will have a parkland golf course that will be considered one of the best around.